Majestic, regal, rich, magnificent, special, enlightened, inspired, charismatic, confident, egotistical, fame, fortune. Shiny polished metal, soft shafts of sunlight. Golden glimmer, glitter, glint, sheen or glow. Sun gods, illuminated lettering, golden halos, crowns, thrones, armour and coins. Firedancer Red is a vibrant crimson. If you have a deck of Aura Cards and you find this colour a challenge to read, this section is for you! This generally isn’t an easy colour to talk about with most people. Generally, if I sense a client is unable to explore sexual issues and/or power issues with me, I simply glide over the top of it and don’t delve too deep. There’s no point in pushing up against boundaries that won’t budge, or offending someone, and I have great respect for the privacy of others. *Kundalini energy: We have a potent sleeping energy at the base of our spine that awakens and rises up the spine, through the chakras, as we awaken and grow spiritually. Research, discuss, explore…. what is kundalini energy, and what does it mean to you? Visualise a red fire of light rising gently and slowly from your base chakra, winding its way upwards along your spine and slowly, carefully, gently awakening each energy centre as it rises. “I am balanced in the expression of my fire” is a useful mantra to use with this visualisation. *Teenagers, issues from your teenage years and your inner teenager. The card itself can represent any of these three. *Taking risks. This colour will generally encourage us to take pretty crazy risks. If you tend to play it overly safe and stay in your comfort zones, this could be a good thing! But it’s worth exploring any tendency to leap before you look. *Short-term gratification. This colour stimulates our desire for short-term gratification and dampens down our ability to honour our long term, deeper values. Are you compromising your deeper values for a quick fix or a brief flash of pleasure? What might you be risking? Learn the positions and colours of the traditional rainbow chakra system in this guided self-care meditation. This meditation guides you through the process of balancing your chakras with colour-breathing and creative visualisation. You don’t have to see clear pictures in your mind for this to be effective. Creative visualisation is actually a multi-sensory experience, a combination of imagery, feeling, sound, thought and so on. In much the same way that we experience the sensory richness of story while reading a fictional book, your task is simply to stay focused on the story being told by engaging your imagination. This meditation will come to life with practise, and you will start to notice that some colours are easier to imagine than others. These are the chakras that are healthy! If a colour is more difficult to imagine, or you find yourself becoming easily distracted and unable to focus on that colour, it may be because this chakra is blocked. 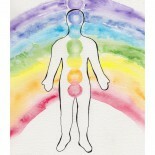 Continued colour-breathing practise will gradually unblock these chakras.